Desarrollamos proyectos propios de investigación y promovemos la interacción de académicos de diversas áreas de la economía, con particular énfasis en microeconomía. Asimismo, difundimos los hallazgos y el aporte de la ciencia económica mediante la docencia y el desarrollo de iniciativas de diseminación. Lima School of Economics, in association with Vancouver School of Economics, organizes the Lima Summer School in Economics on a yearly basis. Participants can attend mini courses on advanced and relevant topics in Economics taught by leading international researchers. Lima Summer School is a great opportunity for postgraduate and advanced undergraduate students in Latin America to interact with and learn from a world-class faculty. It also offers recent graduates and practitioners in economics the opportunity to develop and strengthen their areas of expertise. The 2019 Lima Summer School in Economics will include the following topics: Empirical Research in Economic History: Recent Topics and Methodologies, Economics of Strategy, and The Economics of Incentives in Public and Private Organizations. The Faculty is composed by professors from Vancouver School of Economics as well as by associated members of Lima School of Economics. Dr. Mauricio Drelichman is an Associate Professor of Economics at the University of British Columbia, and a Fellow in the Canadian Institute for Advanced Research. He obtained his Ph.D. in 2003 from Northwestern University. He is a co-author of “Lending to the Borrower from Hell” (Princeton, 2014), which combines detailed archival research with international economics theory to explore the nature of sovereign defaults in the sixteenth century, highlighting their macro-insurance properties. His previous work focused on the nature of the urban economy in early modern Toledo; the structure of the Spanish nobility and its impact on local economies; the role that apparently inefficient institutions can play when legal systems are too rigid to adapt to a changing economic environment; and the interaction between resource windfalls and institutions. Dr. Gabriel Natividad is a Professor of Economics at Universidad de Piura (Lima) and a member of the Lima School of Economics. He received his PhD at UCLA. His finance-related research has been published in the Journal of Finance, the Review of Financial Studies, the Journal of Financial and Quantitative Analysis, and the Review of Corporate Finance Studies. His work also spans the fields of industrial economics and strategy, and has been published in the RAND Journal of Economics, the Journal of Industrial Economics, the Journal of Economics & Management Strategy, Management Science, Organization Science, and Strategy Science. Born in Lima in 1977, he studied Economics at Universidad del Pacífico, where he won the Premio Robert Maes in 1995, 1997, 1998, and the Premio Robert Maes Especial in 1999. Miguel Ángel Martínez Carrasco is an Assistant Professor at The Universidad de los Andes School of Management in Bogotá, Colombia. He obtained his PhD in Economics from Universitat Pompeu Fabra in Barcelona, Spain, and his BA in Economics from Pontificia Universidad Católica del Perú. His research focuses on understanding the role managerial practices and incentives have as key drivers of productivity gains in private and public organizations. His recent work explores how firms’ termination (firing) policies generate negative spillovers across workers when they handle inputs of different quality, and provides policy guidance to reduce their negative impacts. His work has been published in leading economics journals such as Experimental Economics and the Review of Economic Studies. The 2018 Lima Summer School in Economics will include the following topics: Regression Discontinuity Designs, Empirical Analysis of Wage Differences: Discrimination and Decomposition Methods, and Behavioral Economics Applied to Healthcare. The Faculty is composed by professors from Vancouver School of Economics as well as by associated members of Lima School of Economics. The 2017 Lima Summer School in Economics will include the following topics: Identification Issues in Applied Econometrics, Taxation and Pension System Reform, and Banking and Corporate Finance in Emerging Economies. The Faculty is composed by professors from Vancouver School of Economics as well as by associated members of Lima School of Economics. The 2016 Lima Summer School in Economics included three courses: Economics of Nonrenewable Resources: Overview and Recent Developments; Economics of Competition Policy; and Advanced Topics in Policy Evaluation and Research Design in Economics. The Faculty of the 2016 edition was formed by professors from Vancouver School of Economics as well as by associated members of Lima School of Economics: Dr. Brian Copeland (PhD Stanford University), Dr. Thomas Ross (PhD University of Pennsylvania) and Dr. Jose Galdo (PhD. University of Syracuse). Fairness or spite? What is the Ultimatum Game About? The economics department at Universidad de Piura aims to produce cutting-edge research in economics. As part of this goal, it has organized six international workshops for young economists since 2007. To complement this effort, it is now inviting applications for its First Young Visiting Scholar program, as we recognize the growing importance of gathering and connecting young scholars from the best academic institutions in the world. This first call is for the period March-August 2019. The minimum length of the stay is three months. We may accept up to 2 visiting scholars. Este evento convoca a economistas peruanos que hayan completado recientemente su tesis doctoral o estén próximos a concluirla. El propósito es que presenten su investigación y la enriquezcan con los comentarios del resto de participantes. La periodicidad de este evento es bienal. Desde el primer workshop, 40 economistas de más de 25 universidades de Norteamérica y Europa han expuesto sus proyectos de tesis doctoral. El VII International Workshop for Young Economists se realizará el 2 y 3 de agosto de 2018 en el marco del V Congreso Anual de la Asociación Peruana de Economía, el cual tendrá lugar en el campus Piura de la Universidad en Piura. El plazo para el envío de papers se encuentra abierto hasta el 30 de abril de 2018. "Overcoming the Tyranny of History: Evidence from Post-Apartheid South Africa"
"Competition and Quality Upgrading in Export Markets: The Case of Peruvian Apparel Exports"
"The impact of Labor Market Frictions on Exporting Firm"
"Electrification and Educational: Outcomes in Rural Peru"
"Promoting Pro-School Behavior through Reinforcement Messages"
"Estimating country heterogeneity in aggregate CES production functions"
"Does Unemployment Insurance Discourage on-the-job Search? Evidence from Older American Workers"
"Group lending with heterogeneous types"
"Terms of Trade in Small Open Economies: The Role of Monopolistic Output Markets"
"Resource Curse, Political Support and Democratic Consolidation: Evidence from Peru"
"The Strategic Default with Neighbors: A Laboratory Experiment"
"La Formation des Aspirations Monetaires au Perou : Une Analyse des Processus d Adaptation et de Comparaisons Sociales "
"Wealth Schocks and Health Outcomes: Evidence from Stock Market Fluctuations"
"The Role of Social Capital on Improved Cooking Stoves Usage Decisions in the Peruvian Andes"
"The Relationship between Maternal Education and the Production of Cognitive Skills in Children: The Case of Peru"
"The Effect of Telecommunications Technologies on Agricultural Profits and Child Labor: Evidence from Isolated Villages in Peru"
"Private Information in Concentrated Markets with Forward Contracting"
"Signaling Creditworthiness in Peruvian Microfinance Markets: The Role of Information Sharing"
"Civil Conflict and Human Capital Accumulation: The Long Term Effects of Political Violence in Peru"
"Impact of Property Rights on Poor Households’ Investment Decisions: A Treatment Evaluation of a Titling Programme in Peru"
"The Impact of Land Titling on Labor Allocation: Evidence from Rural Peru"
"Demography and the Predictability of Savings: The Role of Socialization"
"The Impact of Armed Conflict on Early Health and Nutrition in Peru"
"Candidate Selection and Quality of Politicians: Theory and Evidence from Latin America"
"Does Pension Saving Crowd Out Voluntary Saving? Evidence from Social Security Privatization in Peru"
"Can Competition Conditions and Market Structure Explain High Price Cost Margins in the Pharmaceutical Industry? The Case of Antihypertensives"
"Testing for Rule of Thumb Price Setting"
"The Welfare Losses of Price Rigidities"
"Institutions and Cyclical Properties of Macroeconomic Policies"
"The Determinants of Rising Informality in Brazil: Evidence from Gross Worker Flows"
"Accounting for Output Drops in Latin America"
"Great Moderation Debate: Should We Worry about Using Approximated Policy Functions?" "Effect of Market Structure on Health Quality in the New Jersey Hopsital Industry"
"Optimal Agency Contracts: The Effect of Vicarious Liability and Judicial Error"
"An Estimated Stochastic General Equilibrium Model with Partial Dollarization: A Bayesian Approach"
"Heterogeneous Impacts of Conditional Cash Transfers: Evidence from Nicaragua"
"Resurrecting the Role of Real Money Balance Effects"
"Is the Relationship between the US Current Account and Output Symmetric?" "Training Quality and Earnings: The Effects of Competition on the Provision of Public-Sponsored Training Programs"
"Optimal Monetary Policy in a Small Open Economy under Segmented Asset Markets and Sticky Prices"
"Inflation Premium and Oil Price Volatility"
"Economic Experiments to Measure Trust and Reciprocity in 6 Latin American Cities"
"Aggregate Effects of Imperfect Tax Enforcement"
"Macro-Finance Implications of a General Equilibrium Model with Agency Costs"
"Input Allocation, Workforce Management and Productivity Spillovers: Evidence From Personnel Data". The Review of Economic Studies (2018). DOI: 10.1093/restud/rdy010. "Consumer Default, Credit Reporting and Borrowing Constraints". Journal of Finance 72.5 (2017): 2331-2368. "Progresive universalism? The impact of targeted coverage on health care access and expenditures in Peru". Journal of Health Economics 26.12 (2017): 1479-1868. 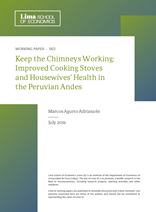 "Social capital and improved stoves usage decisions in the Northern Peruvian Andes." World Development 54 (2014): 1-17. "The impact of an increase in the legal retirement age on the effective retirement age." De Economist 162.2 (2014): 115-145. "Integration and productivity: Satellite-tracked evidence." Management Science 60.7 (2014): 1698-1718. "Improved cooking stoves and firewood consumption: Quasi-experimental evidence from the Northern Peruvian Andes." Ecological Economics 89 (2013): 135-143. "Vulnerability to individual and aggregate poverty." Social Choice and Welfare 41.4 (2013): 721-740. "Cheap credit, lending operations, and international politics: The case of global microfinance." The Journal of Finance 68.4 (2013): 1551-1576. "Financial capacity and discontinuous investment: Evidence from emerging market multibusiness firms." The Review of Financial Studies 26 (2013): 2375-2410. "Financial slack, strategy, and competition in movie distribution." Organization Science 24 (2013): 846-864. The view of poverty as a multidimensional phenomenon has swiftly become mainstream. 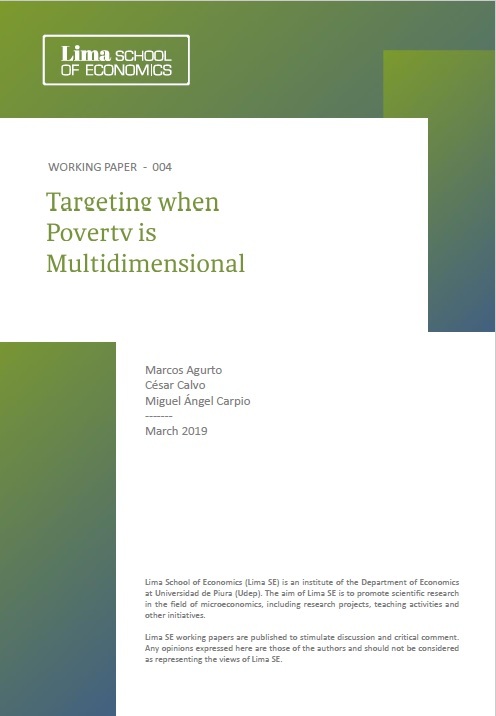 However, the debate remains open as to how such ‘multidimensional poverty’ should be assessed in practical settings, particularly when identifying the beneficiaries of poverty alleviation programmes. This paper develops a novel empirical approach that explicitly takes into account the goals and needs of the policy-maker. In particular, the paper takes up the case of a government official running a budget constrained programme to alleviate a few dimensions of poverty, and translates her concerns into a set of desiderata which the multidimensional measure should meet. The policy-maker targeting ability and aversion to the risk of leakages play crucial roles in setting the desired properties. We illustrate our methodology in the context of a CCT programme in Peru, and show that it improves expected leaking and undercoverage relative to alternative Alkire-Foster based approaches. 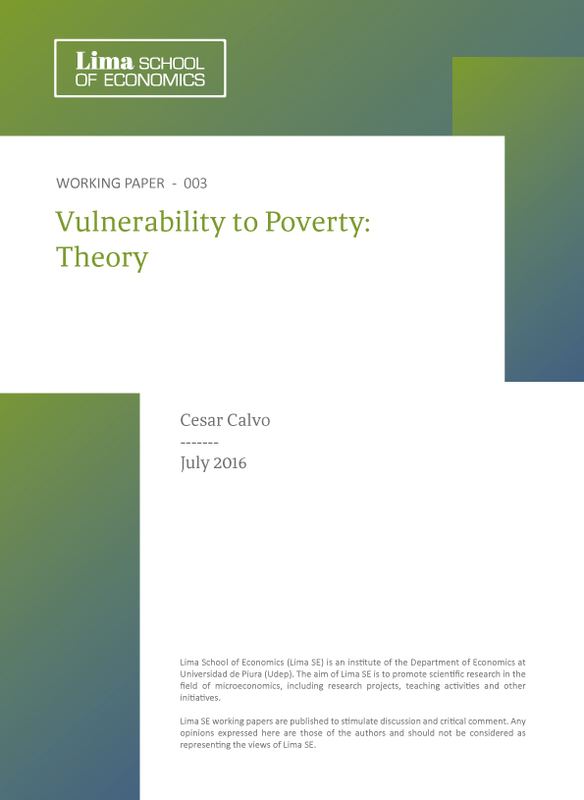 Two competing strands exist within the theoretical literature on vulnerability to poverty, each with its own policy implications. Vulnerability may be seen as low expected utility and thus stress the danger of self-perpetuating poverty, as the poor shy away from risky, yet necessary decisions to escape their hardship. Alternatively, vulnerability is often construed as expected poverty and provides policy-makers with a forward-looking viewpoint that both sheds light and raises new questions on how best to formulate the targeting of social spending. This paper provides an overview of the theoretical work underpinning each of these competing views. This paper examines the effects of long term improved cooking stoves (ICS) usage on selfreported eye irritation symptoms and respiratory health in the Northern Peruvian Andes. To identify the effect of ICS, we exploit field data related to the quasi-random distribution of ICS with faulty iron frames. Our results indicate that ICS long term usage, with an operative chimney, reduces respiratory illnesses and eye discomfort symptoms among housewives. It is also shown that in the case of respiratory health, other household members may benefit from reduced household air pollution (HAP) exposure. This paper proposes three indicators constructed from the surnames of the current population to analyze the effect of mita, a forced mining labor system in Peru and Bolivia during 1573 and 1812, on historical migration. The underlying assumption is that surnames within a community might be the same over time unless migration or mortality displacement takes place. The mita case is particularly appealing for applying our indicators because the use of surnames was introduced in the study region only since the Spanish conquest in 1532. We estimate the effect of mita by using a regression discontinuity design similar to the one conducted by Dell (2010), which exploits the exogenous variation in its geographic assignment.